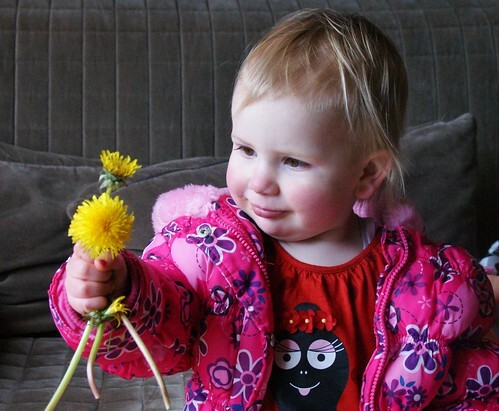 Dandelions for mummy, a photo by PhylB on Flickr. It's the thought that counts, I guess! I spend every spring, summer and autumn on my knees pulling dandelions out of my lawn. I hate them with a passion. Turn your back for ten seconds and they multiply like rabbits. And they always come in twos. This year we have more dandelions than lawn. Given the beautiful weather this week, I have spent more time on my knees than usual! I am totally scunnered with dandelions. Today I had to work so Thomas took the kids out for a walk. Amaia came bouncing in afterwards with a bouquet for me! Dandelions - thanks Bops, that's lovely. Followed closely by Anna who had not only picked me twice as many and even stuck them in a vase! My kitchen is now overflowing with dandelions! Thanks kids! Sorry, when did I move to America? Too weird for the UK market? What is it about pears? How mature is a 12 year old? How much did I miss you? Just to make my life a little harder!